The process of music performance has been the same for many centuries: a work was perceived by the listening audience at the same time it was performed by one or a group of performers. The performance was not only characterised by its audible result, but also by the environment and the physical presence of the performing artists and the audience. Further, a performance was always unique in the sense that it could not be repeated in exactly the same way. The evolution of music recording technology imposed a major change to this situation and to music listening practise in general: a recorded performance suddenly became available to a dramatically increased number of listeners, and one could listen to the same performance as many times as desired. However, in a recorded music performance, the environmental characteristics and the presence of the performing artists and the audience are lost. This particularly includes the loss of musical gestures, which are an integral part of a music performance. The availability of electronic music instruments even enforces this loss of musical gestures because the previously strict connection between performer, instrument, and listener is blurred. This thesis deals with the problem of the construction of musical gestures from a given music performance. A mathematical model where musical gestures are represented as high-dimensional parametric gesture curves is introduced. 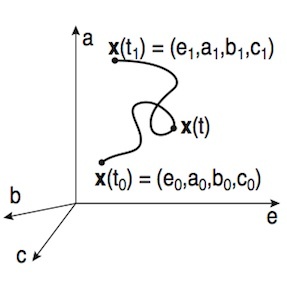 By providing a number of mathematical operations, the model provides mechanisms for the manipulation of those curves, and for the construction of complex gesture curves out of simple ones. The model is embedded into the existing performance model of mathematical music theory where a musical performance is defined as a transformation from a symbolic score space to a physical performance space. While gestures in the symbolic domain represent abstract movements, gesture curves in the physical domain reflect “real” movements of a virtual performer, which can be rendered to a computer screen. For the correctness of the movements one has to take into account a number of constraints imposed by the performer’s body, the instrument’s geometry, and the laws of physics. In order to satisfy these constraints a shaping mechanism based on Sturm’s theorem for cubic splines is presented. A realised software module called the PerformanceRubette provides a framework for the construction and manipulation of gesture curves for piano performance. It takes a music performance and given constraints based on a virtual hand model as input. The resulting output consists of sampled physical gesture curves describing the movements of the virtual performer’s finger tips. The software module has been used to create animated sequences of a virtual hand performing on a keyboard, for the animation of abstract objects in audio-visual performance applications, and for gesture-based sound synthesis. Keywords: Gestural Performance, Performance Interfaces, Performance Theory, Computer Animation. This entry was posted in Music, Publication, Research and tagged Guerino Mazzola, Musical Gestures, Performance Theory, Portfolio on June 25, 2010 by robot.